I belong to a wonderful group on Ravelry in which we have a yearly goal of twelve adult sweaters a year. I’ve been part of this group for quite a few years now, and I have never managed to knit twelve sweaters in a year. This year, I have so far only finished three (!) and the odds of my hitting four are steadily diminishing. I am not alone in this regard, however – the group consists of some incredibly productive knitters who hit their goal of twelve within the first six months of the year, others who challenge themselves and struggle to reach twelve, and many others who know they will never actually accomplish that much knitting, but love the group anyway. I have looked at every sweater posted by each member of this group for at least four years now. They are an incredibly nice and inspiring group of knitters. One of my favorite parts of the year is in late November and December when group members start posting their wish lists for the following year. Some people are so organized – they list each sweater in order, and already know exactly which yarn they will use for each project. (Often, they already have the yarn for each sweater lined up and waiting to go.) 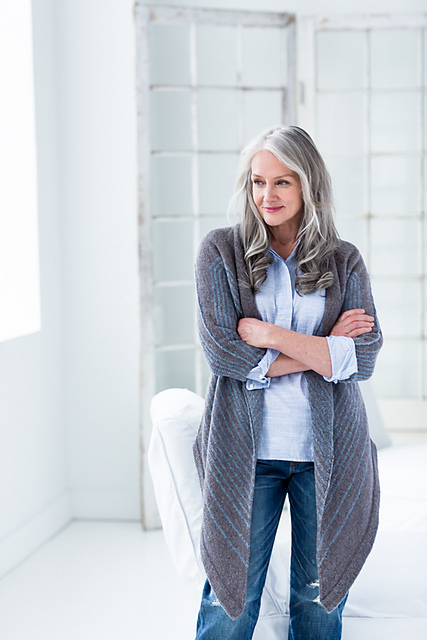 Some have very vague ideas of what they what to knit and say things like “a warm cardigan” or “something to match my blue dress”. Some can’t decide and have dozens of options. I love these posts in part because I can find new patterns and see which patterns are trending. Mostly I love them because there is a heady kind of optimism in the process. Maybe you only managed two sweaters this year, but next year is a clean slate – you can be as practical or as unrealistic as you like. I have spent the last week thinking a bit about my Wish List. It is certainly a flight of fantasy as I will never have enough time to knit them all. It also changes every time I think about it – I suppose I am a rather fickle knitter. 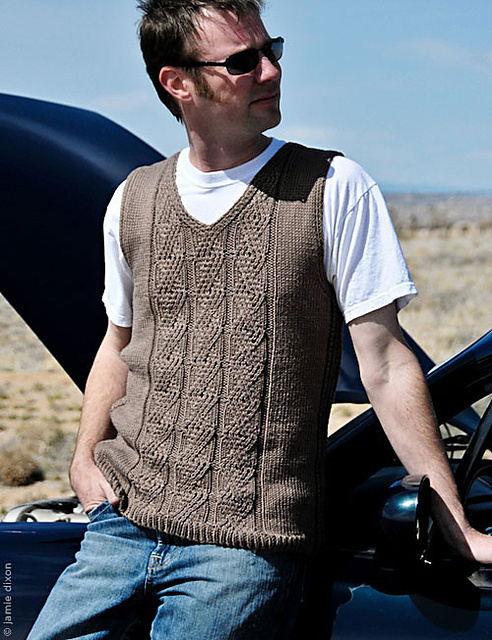 Here, for your benefit, I present today’s version of my 2015 Knitting Wish List. It is bound to change within minutes. Since I knit as much for my family as for me, I have picked out 3 sweaters for each of us. We will start with me, because a Wish List should be selfish. 1. This year, I feel drawn to simplicity. I want garments that are easy and have good drape, that look comfortable but also have inate style. It could be because I have put on weight this year and all my clothes feel tight. Whatever the reason, my Wish List for me is all about easy, like Wake by Veronik Avery for BT Fall 14. 2. I love Pente, by Carol Feller. I have a favorite cashmere cardigan (purchased) that has roughly this shape, which I have worn pretty much to death for the last 10 years or so. And I just managed to leave it behind somewhere in South Africa! Definitely time for a snuggly, big, cozy cardigan to throw on with my jeans. 3. 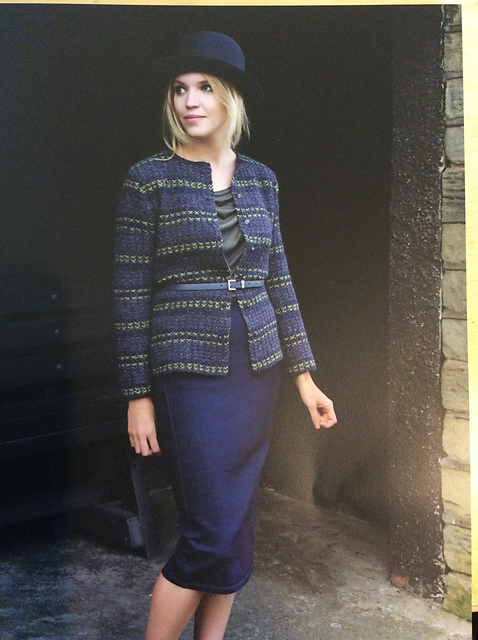 I’ve already bought the pattern for Soyokaze, designed by yellowcosmo for the lovely e-magazine Amirusu. Although I love it in grey, I will most likely go for a strong jewel colour, maybe green. 4. While I am attracted to ease and comfort right now, Emma loves a bit of tailoring. This is Touch by Kim Hargreaves. I think she’d like it. 5. I love knitting warm, cozy, fall and winter sweaters. But summer knitting can be nice too. The Belgravia Tee, designed by Robin Melanson, is super elegant and it just says “Emma” to me. 6. 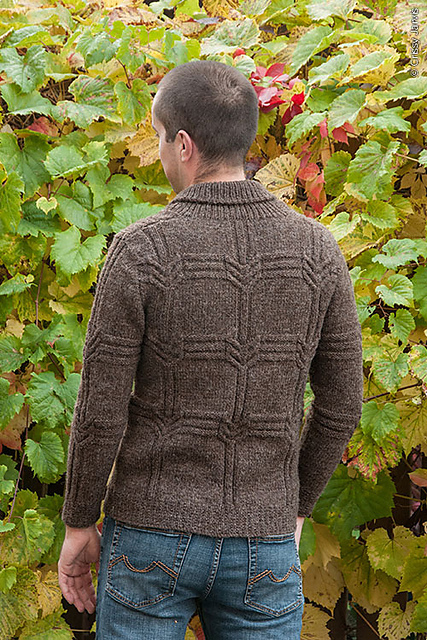 This is the Cable Round Sweater by Linda Marveng. It would look great on Emma. I like the versatility of the matching cowl; it makes this more like having two sweaters in one. 7. 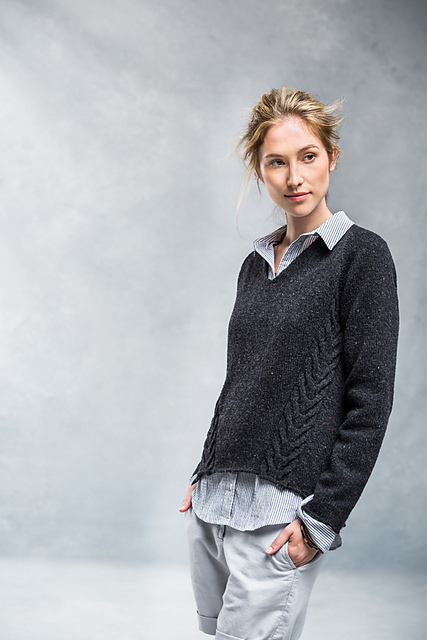 I like the look of the Flyaway Hoodie by Joji Locatelli for Leah. It is knit in Malabrigo and would be so cozy. 9. Here is another one which I think would suit Leah, and would also be fun to knit. Behind my Back, by Justyna Lorkowska, is a plain crew neck in the front, but the back is a surprise of beautiful lace. 10. I think that Doug needs some vests. (This has absolutely nothing to do with the fact that I hate knitting sleeves.) In fact, he should have two, a rustic one and a snazzy one. Here is the rustic: Laredo by Angela Hahn. 11. And here is the snazzy one: Machrihanish by Kate Davies. 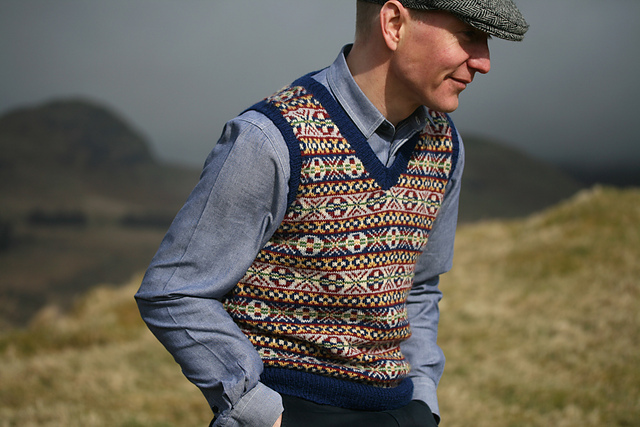 It combines the traditions of fair isle with a very modern sensibility. I love it. 12. Last, but not least, here is a new one. 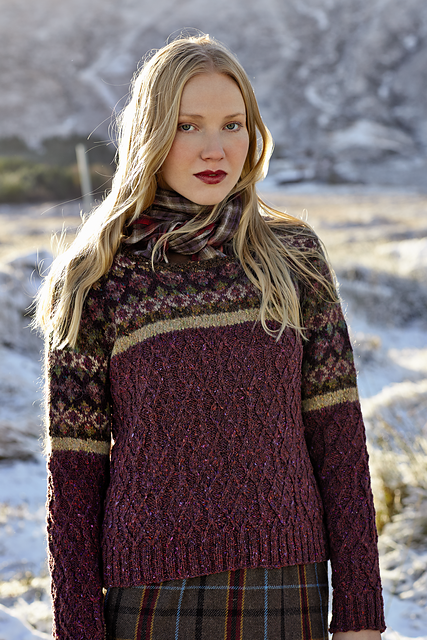 This pattern, Quiver by Megh Testerman, was just released this week in the new Twist Collective edition. Quick! I must publish this before I change my mind again! Admit it, dear reader, you need a Wish List too! This entry was posted in Main and tagged Crafts, Kniting Wish List, Knitting, Knitting patterns by knitigatingcircumstances. Bookmark the permalink. What a great list you have chosen for yourself and Emma! Thank you so much for including my Cable Round Sweater! Let’s hope I can find more time to knit next year, Linda. I’ve got some of your other patterns on my radar too. I will cross my fingers, Kelly! That is marvelous to hear! Thank you! As I was putting this list together, I was thinking “I bet Romi would love Wake” (number 1). Great minds and all that…. I could not agree more! I am delighted to hear that Cable Round is on your list too, Romi! Thank you! I retired last year and now work P/T in a LYS. I love it. I love your blog! This one I think I’ll pass out to my students to inspire them to think about project planning and get excited about the possibilities. Thank you for commenting. Retiring and working part-time in a LYS is like a dream to me……. Good picks, I really like quite a few of these patterns! Thanks! It was very hard to narrow down the field. Love your list!! Three sweaters and a vest is my max, along with numerous hats, cowls, mitts, scarves and eight pairs of socks!! I can’t even begin to imagine knitting eight pairs of socks. You go, girl! i just love number 5!!! It’s really pretty, isn’t it? You should click on the link and look at the front, as well. Thank you for this comment, Cheri. I must say that recently I am so overwhelmed (with work and school) that I sometimes wonder whether I should quit writing – so it’s nice to hear from people who enjoy reading the blog. I haven’t even begun my list yet, but this was an inspiring reminder to do so – I love the men’s fair isle vest and wish there was a man in my life who would wear it. It is pretty, isn’t it? Yelena, you could probably knit a complete sweater in the time it takes me to write a post! By the way, as soon as I lose some weight, your Better Breton (http://www.ravelry.com/patterns/library/better-breton) will be on my list. I definitely love the second cardigan, Pente, but I’m a bit reluctant to knit something so work-engaging at this time… I’m recovering after two sweater disasters and won’t be knitting sweater any time soon..